Jamun - The Purple Fruit! As a child, I always referred to Jamun as the fruit which turns you tongue purple! All the kids love it for its colour. The taste of the fruits is a nice mix of sweet and sour. It’s a tall and evergreen tree, native to the South Asian countries.Its reference is also found in the epic Ramayana, where Rama is said to have enjoyed this fruit throughout the 14 years of exile. Jamun leaves were used for healing pus filled wounds in the ancient days, which suggests that it has anti-bacterial and healing properties too! Being rich in antioxidants, it improves immunity and helps to prevent Cancer. 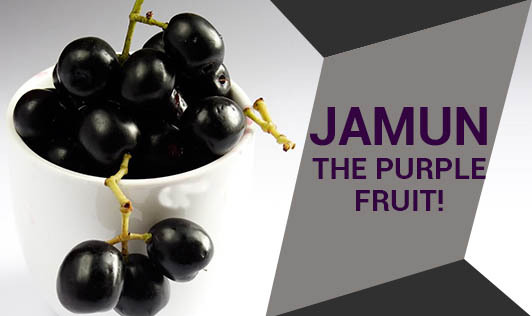 Fact: Powdered seeds of jamun fruit have certain components which help to control the blood sugar levels. But it does not cure Diabetes. Diabetes can be controlled only by eating a proper diet, healthy lifestyle, good amount of physical activity and proper medications. Add jamun pulp in wheat flour and prepare small pancakes for your kids. Jamun ice cream can be prepared at home. It can be cooked with a little sugar and added on vanilla ice cream as a topping. Same can be added on cookies as a topping. Jamun jellies and jams are kid’s favourites! Jamun smoothies also can be a great option for evening snacks.